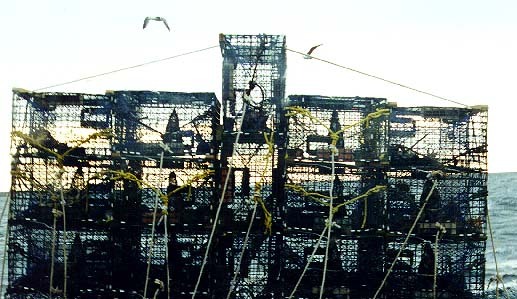 A stack of 10-trap trawls being moved to a new location. The web is a vast source of information, but information without experience is merely data. It is the experiences, knowledge, and efforts of real people that make a project like this fun and (hopefully) meaningful. Thanks to the following people for their continuing help and insights. Full time lobsterman and owner/captain of the 'Chrissy D.', without whom this site would not have been possible. His willingness to take the time to explain and educate everyone and anyone who is interested testifies to his passion for his work and his concerns for the future of the industry. Executive Director of The Lobster Conservancy, graduate of Woods Hole Oceanographic Institute, and expert on lobster reproductive biology and behavior, who checks my site for accuracy and offers scientific input. Click here for her bio. Vice President of The Lobster Conservancy, with post graduate work in the lobster's feeding habits, and defensive mechanisms, as well as studies in lobster hatcheries and restocking efforts. She too has taken time from a busy schedule to check my site for accuracy and make suggestions. Click here for her bio. All the folks who have e-mailed me on observations, suggestions, and corrections. Readers of this page range from fishermen, to school teachers, to fishery officials, and alot in between from all over the world. My thanks to all. You keep the feedback coming, and I'll keep making the site better.